Home › Life's Lessons › What do you do when you get derailed from your life goals? I just got through one of the most stressful weeks of my life with losing our power in our house (I live in DC) after a snow storm and trying to keep my family warm, clean and fed. The night the lights went out was my birthday and my husband and I had planned a date night out that never happened. It really makes you think of what’s important to you in your life. What was most important was both my husband and my two year old son were with me on that day. (There were stories of people stuck in traffic trying to get home for over eight hours!) We had my cake and sang happy birthday by candlelight. I have had birthdays in the past where I was all alone. I am so grateful for what I do have. The next day my husband shoveled the snow and cleaned off the cars and I packed my family up to go to a hotel for what could be a couple of days. I was thankful to have a partner to share this experience with and support me when life throws you way too many lemons! Who is there for you when things get rough? What would having a partner mean for your life? Actually my son was having a blast riding the luggage cart when my husband and I were concerned about when we would be able to go home and the food going bad in the refrigerator. So we went shopping for immediate food and supplies we needed, and had a nice dinner after we checked into the hotel in the late afternoon. I didn’t get much work done. I also had to reschedule a couple of clients and my website projects were put on hold. That is what I have been spending this week doing – following up with clients and getting back on top of my work load and projects. So how do you get yourself back on track when you have been derailed? How do you stay focused on your goals? When life throws you a curve ball by work getting too busy or personal issues balloon in your face that prevent you from focusing on your goal of getting out in order to meet people in your quest to find that special relationship – are you able to push the reset button and start again? What do you need to do to get motivated again when life seems crazy? This curious coach would like to know! Please leave your comments. PS. Let me help you get back on track with your dating efforts. 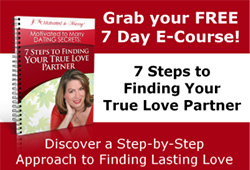 Join my Get Love Right telecoaching group (www.GetLoveRight.com) starting February 22nd. There are only 6 slots available for this group where you will get individual attention and support from like-minded individuals. I also review your internet dating profile (or get you online!). Join before 2/15 and save $200. Lets get started today with your first personal coaching session! Only 2 spaces are left currently. ‹ Relationship Question: How would having more friends help your chances to meet your romantic life partner? Great blog post, Amy! Good questioon (s), too! I went through major “de-railing” about a decade ago, and it did take more than a few weekes to truly reset. It did make me realize the value of having a good support network and caused me to excercise a sometime under-used part of my being, namely FLEXIBILITY. Once I realized the sky hadn’t fallen I was able to (slowly) pick up the pieces and begin to look beyond the series of immediate crises. I think being “other-focused”, grateful for what lessons we are learning and long-term focused on one’s assignments in life is critical to surviving setbacks like these. Thanks George for your insights.